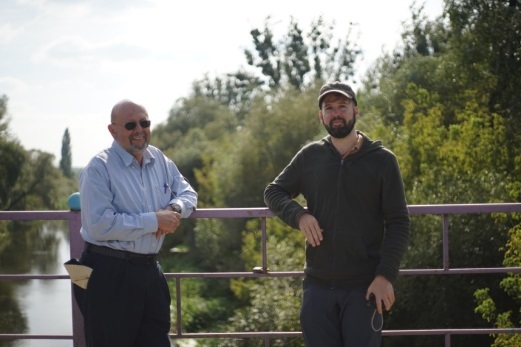 Me and my son Boaz followed my mother Dina's stories about her childhood in the town, looking for the street where she had grown up and the magical places in the Styr River. On Wednesday, two days before Yom Kippur, at the foot of the Memorial monument we lit a memorial candle and said kaddish, in memory of my grandparents, my family and the people of the town. I close my eyes and return to the past. Our grandparents were born in centuries-old communities. There were ups and downs, good days and bad days, but they always survived. Until that war. Rozhyshce is a Ukrainian town. The mayor tells me, "Our history in the town is 75 years old. When we want to teach what was here before, we are going to read your book "Rozhyshce my town", and it is very important for me to keep in touch with the descendents of the town”. Is no longer crying from the ground. From the axis of history. We started the visit early in the morning at the archive in Lutsk. Our guide, a history doctor and an expert on genealogy, searched for documents about Rozhyshce and found only an old map. Later on we met Sergey Shevardutzky, head of the Jewish community. The community in Lutsk is between 150 and 200 people. I do not understand how such a community is maintained and also takes care to preserve the sites of surrounding towns. 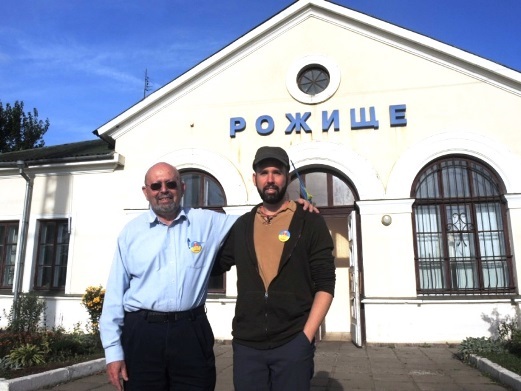 Sergey was very kind and friendly, toured with us in Lutsk and led our visit to Rozhyshce. He is handling the process that is nearing completion, of the declaration of the cemetery in Rozhyshce as a heritage site. When that happens they will not be able to build in the cemetery. The visit to Rozhyshce began in the memorial monument. The place is sacred to us, but very close to it are houses of villagers and around cultivated green fields. The monument is well tended. It was the first time a candle was lit and Kaddish was said for the Liebermanns, Pisenholz, and Bergmann in this place. The quarry behind the monument is very large and still deep, apparently very deep, because after 75 years, thousands of Jewish bodies and years of erosion did not fill it. Currently it used as an improvised shooting range. We went to look for the places near the bridge on the Styr River where my mother used to swim in the summer. The bridge is no longer a wooden bridge, but the river remains a charming river with lovely spots. The flowing river is the most permanent thing here. We continued to the cemetery. The cemetery is not in good condition. The vegetation in the cemetery is well developed. Sergei shows us holes in a tombstone, evidence of bullet fire. The remains of bottles and the junk scattered under the trees, signs of parties by young people jumping over the fence. We continued to the town hall to meet with the mayor. Our guide called him a week in advance. We entered the town hall, a Soviet-style building, and crossed the reception hall where residents sat waiting for a meeting with the mayor. The mayor went out to meet us, was very friendly, and the meeting took more than an hour. His grandmother was one of 70 Ukrainian families who had lived in Rozhyshce before the war and witnessed the slaughter in the quarry. We talked about the state of the cemetery. According to him, they perform pruning once a year in the spring. I asked him if this was a budget problem. According to him, this is not a problem that money will solve. The town has an annual plan and the Jewish cemetery is one of the sites within the municipality's work plan. What is important in his opinion is maintaining the presence and visits of former residents of the town. For example, members of the Polish community who came from Poland several times a year and worked to maintain the Polish cemetery by themselves. In the long term, he believes less in preserving what remains of the cemetery. He has a vision to create a monument in the form of a museum / multicultural center that will show the history of all the communities that were in Rozhyshce with their heritage. He is very interested in contact with the former residents of the town. And he will be glad to have more visits. At the end of the meeting he gave us the city flag and the city pin. The day before the visit to Rozhyshce, I searched for the traces of my father's village, which was totally destroyed in the war - Sokolowo, south of Lvov, near Stry. I found a field and a forest covering the area where the village was in a very remote place. 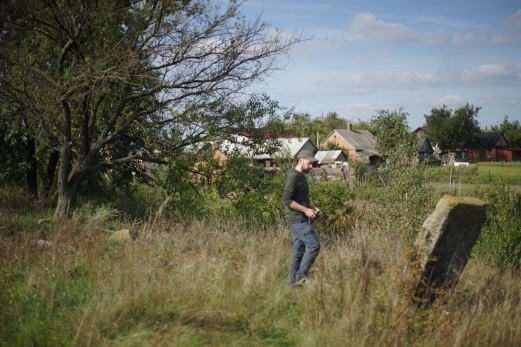 In a nearby Ukraine village we have met locals that told us that there is a Jewish cemetery in the area. Under their guidance we found it. To our surprise it was well maintained, by ”Oholei Zadikim”- an organisation that has tasked itself with the preservation and refurbishment of Jewish cemeteries, founded by Rabbi Meir Gabbay. The association has an office in Jerusalem. Maybe we should contact him. After the meeting with the mayor, we toured the town and the train station, which had not changed for decades. We ate at the Styr Restaurant in the main square. The restaurant looks like a Soviet-era wedding hall. From the window of the restaurant that sits above the city square, shoppers are seen in the market on the square. Above all stands the bleak image of Bogdan Khmelnytsky monument. Our strongest impressions of the visit to Ukraine were a sense of connection, touching the life experience of all those relatives we never knew. The open landscapes, the fields, the rushing rivers, the proximity of a small village that lived as a very tight community, warm and fruitful to Christian villages, and the thrill of knowing that at a distance of dozens of kilometers there is an impressive and beautiful city like Lvov, Italian streets, bustling squares, and an educational and cultural life at the forefront of Europe. Being in direct presence in these places and the pastoral images, it was hard to hear the stories of war and destruction in the same way we heard them in Israel. The words are blown in the wind over the open landscapes; their blood color is mixed with green, yellow, and blue of fields and sky. Here they lived a full and complete life, with many beautiful chapters until the last chapter.